To help you get started, RMVR provides several avenues if you don’t wish to buy a race car first thing. As part of our annual spring Drivers’ School there is a Precision Driving School curriculum structured to accommodate using your normal street car. It need not be race prepared, only safety checked. You’ll still learn all the basics of racing with lots of track time and professional instruction. It’s a great way to see if you want to take the next step and buy a race car. Currently RMVR offers three race cars as “Scholarships”. You must apply and be accepted for each program. If you are interested in driving one of these cars in RMVR’s Drivers’ School, please apply early! The cars are a Formula Ford, a Formula Vee and a Triumph Spitfire. The RMVR Formula Ford (FF) Race Group is now offering a vintage Winkelmann Formula Ford as a Scholarship Program to those interested in racing a FF with RMVR. This is an Arrive & Drive Program intended to increase the interest in racing with RMVR and, in particular, racing a Formula Ford. This is a voluntary collective effort by RMVR FF racers. The car is donated for use in the Program. Through a collective effort, routine maintenance, tires, car storage, fuel for the weekend and transportation of the car to/from the track is all provided. Trackside support (mechanical and moral) is also a part of the Arrive & Drive Program. While the Arrive & Drive program is meant to remove as many barriers to trying vintage racing as possible, the scholarship recipient is still encouraged to “get their hands dirty” and help out with their weekend activities and preparation as much as possible. To make this happen, an initial pool of money to kickstart the Program was created by a one-time voluntary contributions by RMVR FF racers. Those interested in the Scholarship must apply for the Program (see below). The car is available for the spring RMVR Drivers’ School weekend and up to 2 subsequent RMVR events (excluding the Race Against Kids’ Cancer and the Aspen Snowmass Vintage Grand Prix) to be mutually agreed upon to complete the licensing requirements. Other RMVR race weekends may be available, though not guaranteed. For the RMVR Drivers’ School, the Program is offered free as an Arrive & Drive weekend. However, the recipient must pay the RMVR Scholarship & Mentoring Program school entry fee (currently $450 which includes some additional benefits, application must be filled out and copies provided upon entry to the RMVR Drivers’ School), and have their own (or borrowed) racing gear. For racers new to open wheel cars, the car will also be made available for a required track lapping day (track fee paid for by the recipient) in the car prior to the Drivers’ School weekend. For subsequent race weekends the Arrive & Drive Program will cost a $500 Support Fee (paid into the FF Scholarship Program) and the regular RMVR race entry fee (and/or any desired track lapping day fees). Additionally, the driver will pay at the time of race entry, a $350 “deposit” refundable to the driver upon the purchase of an RMVR eligible FF or CF within 1 year of the Drivers’ School but forfeited if no car is purchased within that time frame. Necessary Liability & Damage Control stuff: See the waiver included with the application. Bill Temple Memorial Drivers’ School Scholarship: Through an extremely generous offer by Belinda Temple, the Vee Drivers Group has established the Bill Temple Memorial Scholarship. 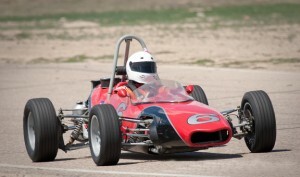 Bill’s RCA Formula Vee #18 will be provided for the annual Drivers’ School along with all supplies and mechanical support—free of charge to an interested and qualified student each year. If a scholarship recipient needs an advisor for the weekend, one will be provided. The Drivers’ School entry fee, successful medical examination, and personal safety gear will be the responsibility of the student. The scholarship recipient will be selected by a group of RMVR Vee drivers. Priority for selection will be based on hours of service to RMVR and the likelihood of the student becoming a regular driver. For further information or to apply for this Scholarship, contact Bill Fleming at rmvr53@aol.com. Ray Jones Memorial Drivers’ School Scholarship: As our second Scholarship, the Historic and Small Bore Race Groups support the Ray Jones Memorial Drivers’ School Scholarship. The former Ray Jones 1964 #92 Triumph Spitfire, “Abby,” was donated by Janine Jones in 2010. It is prepared with donations from the Historic Drivers Group, and cared for by Bill Fleming and Tony Peak. The scholarship provides free use of “Abby” for the annual Drivers’ School. The two race groups provide support for the car including fuel and supplies. Tony and Bill will prepare the car to fit the selected driver. The Drivers’ School entry fee, successful medical examination, and personal safety gear will be the responsibility of the student. The scholarship winner will be selected from applications received by April 15th of each year. Considerations for selection include history of membership and volunteer work with RMVR, and likelihood of entering a car with the club as a regular racer. For further information, contact Bill Fleming at rmvr53@aol.com, Bill Rosenbach at wgrosenbach@juno. com, or Tony Peak at tonypeak420@gmail.com. Another avenue to get in a race car before buying one for yourself is to participate in the RMVR Mentor program. In this program, an existing racer loans a race car to you for the RMVR Drivers’ School and mentors you through that process. The mentor, in addition to helping a friend, receives future race entry benefits, but most importantly it’s a way to get friends introduced to racing. So don’t feel shy about approaching an existing RMVR racer about the possibility of being your mentor. The mentored student (you) gets an entry into the Drivers’ School; a two year membership in RMVR; a one year subscription to Victory Lane Magazine; and an introduction to corner worker marshalling for a coupe of events. All for only $450! The car’s owner and mentor needs to formally initiate the process naming you as his/her protégé. Learn more about this exciting program: How to Mentor a New Driver. Finally, if you don’t have a race car and aren’t able to take advantage of one of the programs listed above, there are numerous racing schools (e. g. Mike Pettiford’s Go4IT, Bonderrant, Skip Barber, etc.) offering excellent instruction in many different types of cars. Successful completion of any of these schools will serve in lieu of our required Spring Drivers’ School in order to qualify for a full RMVR Competition License. If there’s will, there’s a way even if you don’t currently own a race car.